EURAMET has published calibration guidelines to improve harmonisation in the calibration of measuring instruments. All guidelines are listed below according to their technical area and are available for download as PDF version. The Guide is no longer available. TC-L recommends the use of DKD-R 4. The Guide is no longer available. Superseded by ISO 10360 series: Geometrical Product Specifications (GPS) - Acceptance and reverification tests for coordinate measuring machines (CMM). The Guide has been withdrawn since it was outdated and no longer used. The calibration guides were originally published by EAL Committee 2 (Calibration and Testing activities). 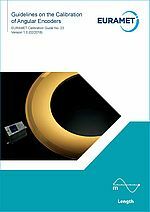 They have been revised and re-published by the corresponding EURAMET Technical Committees (TC). The copyright of all guides is held by © EURAMET e.V. 2007. For further information and to suggest topics for new guidelines, please contact the EURAMET Secretariat or the TC Chair of the corresponding EURAMET Technical Committee. EURAMET e.V. holds the copyright of all documents presented on this page. The EURAMET Secretariat may give permission for the translation. Source: https://www.euramet.org/publications-media-centre/calibration-guidelines/© 2019 EURAMET e.V. is a non-profit association under German law.